Well, hello there everyone! I bet you were all thinking we're dead by now, right? Well, sorry to disappoint but we're not. This release has taken this long due to real life taking precedence over fansubbing, yadda yadda yadda, you all know the drill. Not sure if 56 will come any time soon, to be 100% honest with you all, but it will come, eventually. We won't let this die. The hardsubbed file will be uploaded on the coming days, for whomever wants it. Hardsubs are up! Like the previous post, this will be torrent only for the time being. Episode 55 introduces us to a new hero, Kiranger II! And to an evil scheme to eradicate life on Earth using a bacteria apparently developed by the Nazis... Will our heroes be able to defeat Big Ear Mask, and foil Golden Mask's plan to kill all humans? Watch to find out! Huzzaaaah! 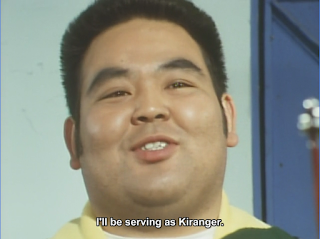 Another sub of the OG Gorenger!! WB; and neat, you're up to Daigorou. Hoo boy, which means we're getting closer to that moment. Yeah for the most part. A lot of people aren't Daigorou fans but he does have a great emotional end; probably one of the best deaths in the franchise. Thanks for this new episode. I'm surprised it was so... rushed. I mean, it's not like it was a last minute thing like Yellow Four's death. They knew the first actor would be busy with his new project so i expected something better than "Oh, i forgot to tell you, the previous Ki Ranger is now a teacher and here's a new chubby and funny Yellow because why not". I'm not an expert in Japanese, but i think the monster said something like "That's what happen when you underestimate a woman" since i hear "onna". Not a huge difference compared to what you say, but i think it's important do add the word woman since she's super cliché as seen in the "make-up" scene a bit after that line. Right? I've heard about this change for so long, and I didn't expect it to happen like that either... It didn't even make for a funny scene, so they should've done something different. That might've slipped by me... Do you have a timestamp, so I can check? I makes me feel so good to see this posted now. Right? It's been a LONG time, I know how you feel xD BTW, check your email today! To Whom It May Concern: Is there any way the Goranger eps (from 1 to now) could perhaps be made available via DDL/mega.nz or such? It's a bit cumbersome and slow to do torrents, at least the older ones. Erm... We got a MEGA folder, y'know? If you check the "Releases" tab on top of the site you'll find it. Episodes 01 - 52 are available there. For the newer ones, I'm afraid you're stuck with torrenting at least for the time being. I heard that Goranger will be getting a bluray release soon. love the work you guys but is it not spelled gorenger and prounced goranger? Thank you so much for the work you guys do,this show brings me immense happines. Love u. Love and Care just put out a post that makes it sound like they will be working on Gorangers now, is that correct, or are you guys still in the game? Well, it is a joint, y'know? We're not out of the picture, not at all, we'll continue working on this show until it is done, or until we are unable to anymore. And LxC will continue to be our partners in this journey, too, for as long as we're in it. Can you release a batch of 33-55? Oh, sure I can! Expect it around Tuesday, I have a test coming up but after that I'll be 100% free to work on that.